Our backyards are home to a myriad of wild animals. However, most of us are familiar with only a small fraction of them. 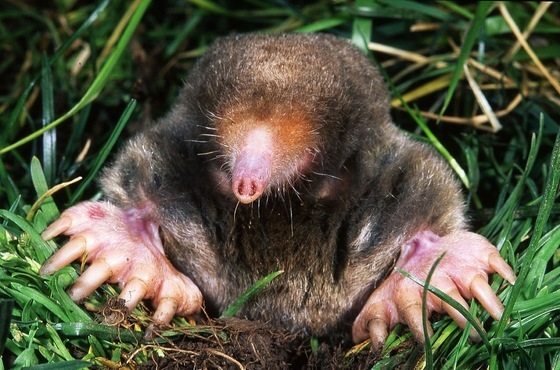 For example, few realize their yard is inhabited by moles until they see a molehill. Many of us were introduced to the mole – in this case, Mole, and his cohorts Rat, Badger and Toad – in Kenneth Grahame's popular children's novel “The Wind in the Willows.” Yet while we and millions of others around the world who have read these stories realize that Mole shares little in common with a real mole, how many of us have stopped to wonder what a mole is really like? Read along as Terry explores the natural world of moles. The first extensive search this century for peregrine falcon nests in Georgia confirmed three key things. The wilds of north Georgia still offer quality habitat for peregrines. Tallulah Gorge still has the state’s only known wild nest site. And metro Atlanta is still Georgia’s favored home for these feathered rockets. In a helicopter survey, the first for peregrine nests since 1995, DNR’s Dr. Bob Sargent and other experts flew cliff faces and other sites for falcons and nests in April. Atlanta buildings where the birds are often seen and have even nested were checked on foot in May. 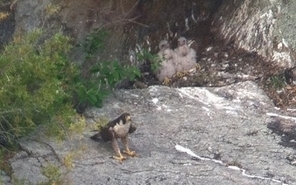 Sargent, a program manager with DNR’s Nongame Conservation Section, said the appearance and success of the nesting pair at Tallulah Gorge State Park (photo below) along with reports of falcons at other mountain sites during breeding season made him wonder if there might be nests on other north Georgia cliffs. These crow-sized falcons are the world’s fastest birds. 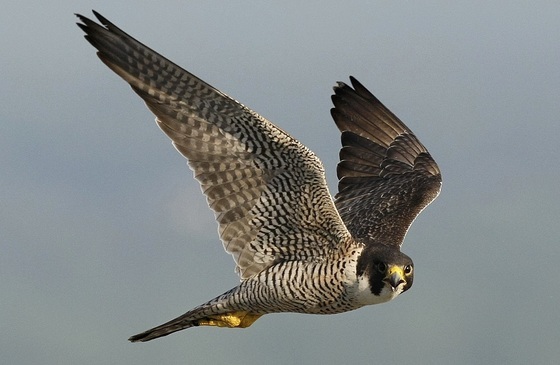 Peregrines are best known for their 200 mph-plus dives, or stoops, on ducks, pigeons and other prey. Although found on six continents, in the U.S. the species is recovering from a mid-1900s population crash linked to use of the pesticide DDT. 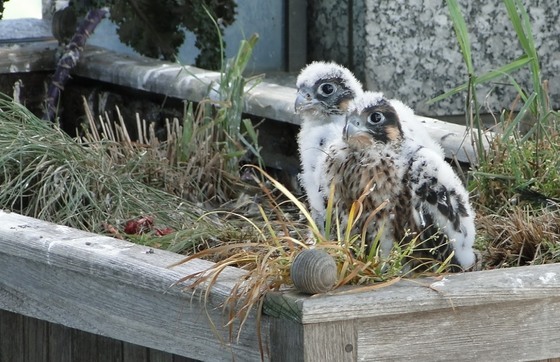 Peregrines were taken off the federal endangered species list in 1999. But they are state-listed as rare in Georgia and rank as a species of significant conservation concern in the State Wildlife Action Plan. This plan is a comprehensive strategy to protect and conserve Georgia's native animals, plants and the places these species need to survive. To help peregrines recover, DNR and partners released nearly 30 young falcons from hacking enclosures in north Georgia and Atlanta from 1988-1994. This region is on the southern edge of the species’ breeding range in the eastern U.S. The survey that Sargent led this year visited those north Georgia sites, and 14 cliff faces in all, from Cloudland Canyon State Park near Rising Fawn to Bell Mountain in Towns County. No eyries, or nests, were found and no falcons were spotted on the cliffs. But at least five areas, particularly Cloudland Canyon, looked suitable for nesting, according to Sargent. Each featured wide and tall cliff faces that were isolated, mostly free of plants and pocked with shelves, overhangs and crevices. Nesting at inaccessible sites helps protect the eggs and young from predators and human disturbance. 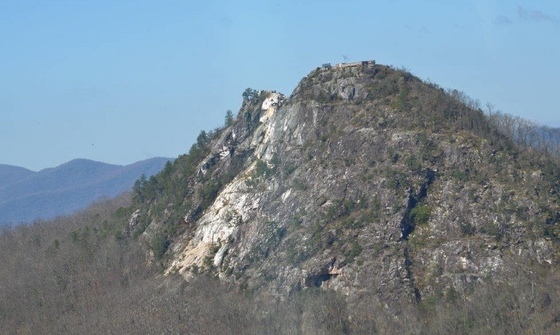 Peregrines have nested on cliffs at Tallulah Gorge State Park since 2015, Georgia’s first nest in a natural site in nearly 75 years. Although the nest failed this year, the falcons have fledged from six to seven young at the park. Sargent said a peregrine was seen at a communications tower in DeKalb County during the April flight and from the ground in May. Birders also have reported falcons in and near a drum-like structure on the tower. Despite speculation about a possible nest in the drum, there has been no definitive evidence of one. DNR’s previous aerial surveys, in 1995, 1992 and 1987, did not document any nests. Instead, befitting its NFL team, Atlanta has been the state’s nesting hotspot for peregrines since 1996. As in some other eastern U.S. cities, the falcons have taken advantage of ample nest sites on high-rises, hunting hours extended by bright lights and plentiful prey, from pigeons and doves to starlings and migrating yellow-billed cuckoos. Although a nest has not been documented in Atlanta since peregrines stopped nesting on SunTrust Plaza Tower balconies in 2015, juveniles have been seen regularly. Observations from sites “between midtown Atlanta and Sandy Springs suggest there might be as many as four (nest) territories,” Sargent said. While surveying in the metro area last month, he was encouraged by people’s fascination with peregrines. One businessman invited him to scan from his high-rise office. He had seen a peregrine on a nearby ledge in March and been interested since. 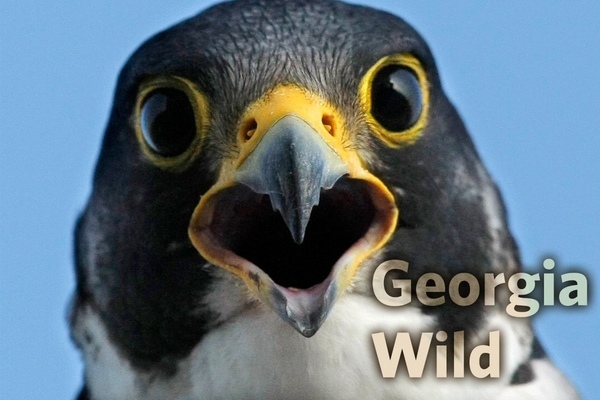 Report peregrine falcon nests or nesting behavior to Sargent, (478) 994-1438 or bob.sargent@dnr.ga.gov. Buying or renewing a DNR eagle or hummingbird license plate. Only $25 extra a year, most of which supports wildlife. Contributing directly to the fund. Joining TERN, Nongame Conservation's friends group. Learning how this support is put to work for wildlife. So begins a new story map created by the conservation nonprofit Manomet. The online narrative featuring photos, video and maps tracks three whimbrels – one from Georgia – along the migration routes the species’ three known breeding populations follow between the Arctic and South America. The story explores the whimbrels’ need for safe areas to nest, rest, refuel and winter. Efforts to conserve these places and birds also are emphasized, including work by DNR wildlife biologist Tim Keyes and the coastal nonprofit One Hundred Miles. 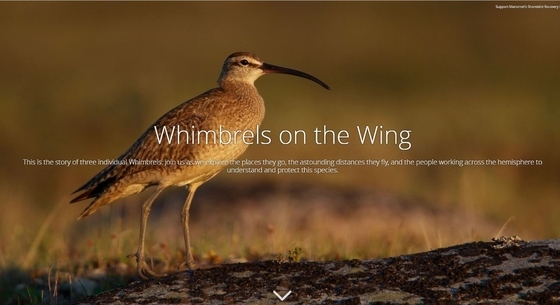 Syncing with the international scope, "Whimbrels on the Wing" is available in English, Spanish, French, Portuguese and Dutch. 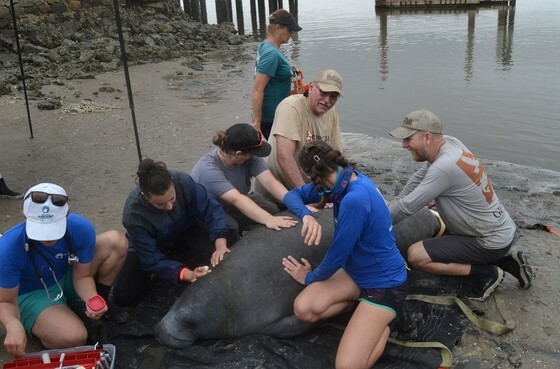 Four more manatees are being tracked to help map the protected species’ movements near Naval Submarine Base Kings Bay, document habitat use on the Georgia coast and collect baseline data to assess manatee health. Started in 2015, the study led by Sea to Shore Alliance and including DNR and Georgia Aquarium caught, attached GPS tags and released the massive mammals in Cumberland Sound May 30. The fungus that causes white-nose syndrome, a disease deadly to bats, has been found for the first time in South Dakota and Wyoming. Meanwhile, a cave myotis bat was confirmed with the disease in Kansas, another first that bumped the number of bat species documented with white-nose to 10. Follow the spread. Coming soon: Georgia’s 2018 WNS report. The Georgia/Alabama Bat Blitz last week in Eufaula, Ala., included 50-plus people and mist-netting bats in both states, with big brown, eastern red, Seminole and evening bats captured at southwest Georgia sites (“Bat Blitz,” May 24). Heavy rains before the event put a damper on catch rates, but follow-up surveys by DNR’s bat crew are planned for this summer. Interested in updates on the Recovering America’s Wildlife Act? Stay tuned to this federal legislation aimed at helping states conserve animal and plant species of concern through Facebook and Twitter (the latter via OurNatureUSA). Mapping habitats to inventory and document natural communities is key to managing DNR wildlife management areas. Staff from the Nongame Conservation Section’s Brunswick office recently helped at Alligator Creek WMA near Lumber City, finding extensive areas of groundcover in uplands and significant communities including slash and pond pine flatwoods, seepage swamps, and bottomlands. Designating Georgia's barrier islands as a landscape of hemispheric importance drew a crowd last month to Harris Neck National Wildlife Refuge near Townsend. The celebration marking the Western Hemisphere Shorebird Network news included about 145 people from the U.S., Canada and Mexico. Those not following the U.S. Fish and Wildlife Service’s Southeast Region are missing some quality articles on conservation. Recent stories include how partners have restored Raccoon Creek in Paulding County and why a federal fish hatchery is vital to the reintroduction of eastern indigo snakes. 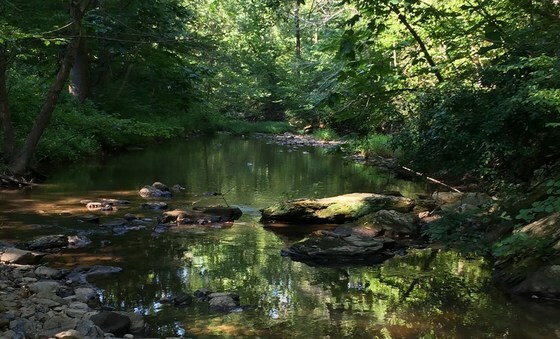 A mussel survey by Nongame Conservation staff in a Cherokee County creek documented 21 federally threatened finelined pocketbooks plus two Alabama rainbows and two Alabama spikes, both petitioned for listing. The creek is the only stream in the Etowah River basin upstream of Lake Allatoona known to have live mussels. Media interest in Georgia wildlife has been hot lately. GPTV’s Georgia Outdoors filmed DNR’s Nathan Klaus and Ashley Harrington for an episode on Fall Line wildlife, an Atlanta Journal-Constitution columnist joined botanist Lisa Kruse to see rare eastern turkeybeard at Dawson Forest Wildlife Management Area and many reporters called Dr. Bob Sargent about eagle nest surveys ("Eagles soar," May 24). Georgians who want to try fishing but haven’t bought a license before have another reason to start: They can land a free fishing trip. New fishing license customers in June and July will be entered to win one of two guided trips, with gear and accommodations included. A fishing camp where youth can learn about fish and fishing is scheduled for June 26-28 at the Go Fish Education Center in Perry. The cost is $75; the deadline to register, June 22 (but call soon; these camps fill fast). Feathers and feces: What to do about Canada geese, particularly in late June and early July when the birds are molting and ground-bound? DNR’s Game Management Section has some answers. Names in the news: Businessman Sam Shine is donating 6,200 acres adjacent to St. Marks National Wildlife Refuge to the U.S. Fish and Wildlife Service. The Florida Panhandle tract is home to rare wildlife and adds to a 100-mile long corridor of conservation lands along the Gulf Coast. The Tennessee Wildlife Federation named Dr. Dwayne Estes of Austin Peay State University as Conservationist of the Year for his work on the Southeastern Grasslands Initiative. Estes accepted on behalf of all who are working to restore and preserve grasslands. The Georgia Conservancy’s Generation Green Board will present Katherine Kennedy its Longleaf Award at the group's Verde! event, June 15 at Inman Park in Atlanta. Kennedy’s work to alleviate hunger and related health issues through the nonprofit Concrete Jungle earned the award, which honors emerging green leaders in Atlanta. Through June 10 – National Fishing and Boating Week. Includes free fishing in Georgia (no license needed) on June 9. June 21-22 – First Detectors Identification-Mapping-Control of Invasive Pests workshop, University of North Georgia, Dahlonega. Register by June 15. 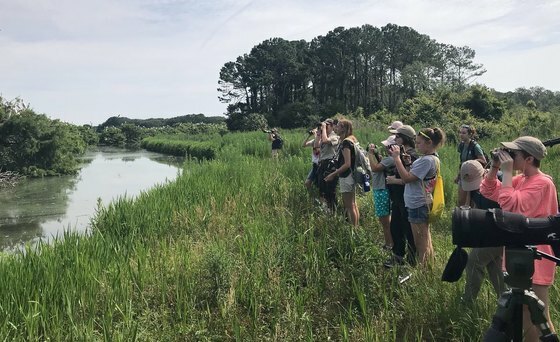 From red-cockaded woodpeckers to black-necked stilts, and from Okefenokee National Wildlife Refuge to Little St. Simons Island, 15 teens saw scores of birds, visited a variety of places and soaked up a wealth of wildlife information this week at Camp TALON. 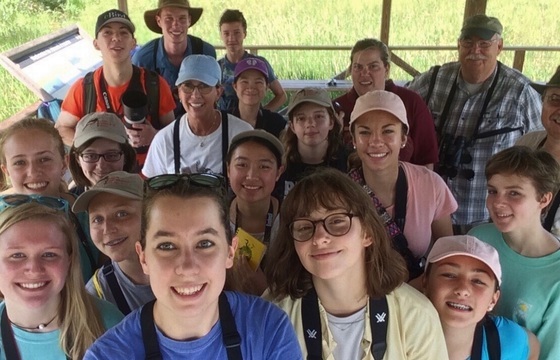 The annual DNR coastal camp led by Dr. Bob Sargent and Julie Duncan and also featuring other birding experts offers teens a deep dive into ornithology. TALON stands for Teen Adventures Learning Ornithology and Nature.